Lumbar radiculopathy is a clinical condition characterized by compression of the nerve fibers that emerge from the lower part of the spinal-cord (present in the lumbar area). It typically causes pain, tingling and numbness in the areas that are supplied by the nerve fibers affected. A well recognized type of lumbar radiculopathy is sciatica which refers to compression of the sciatic nerve (a large nerve that supplies the entire leg). Common causes of lumbar radiculopathy include a herniated intervertebral disc that compresses upon the nerve fibers, formation of small bone spurs (seen in osteoarthritis) that irritate the nerve fibers as they emerge from the spinal-cord and thickening of the vertebra ligaments. Lumbar radiculopathy can also be seen in spinal tumors, abnormalities in the vertebra alignment such as scoliosis and in medical conditions such as in diabetes mellitus. Since the sciatic nerve supplies the muscles in the legs, lumbar radiculopathy that affects the sciatic nerve can cause pain, numbness and tingling in these muscles. Patients may experience difficulty walking and difficulty sitting down for prolonged periods of time. Patients may experience an alteration in sensation in the affected area. Lumbar radiculopathy and sciatica are diagnosed through clinical history and examination. 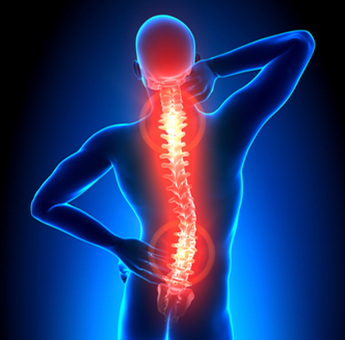 Additional tests such as an x-ray of the spine or CT scan and MRI may be performed to ascertain the underlying cause. These radiological investigations can help determine if the disc is damaged or has prolapsed and whether there are any other degenerative changes that may be leading to these symptoms. Other specialized investigations such as an electromyogram may be conducted to determine the flow of electrical impulses through the nerve fibers to the muscles in the leg. This is not a diagnostic test as such but is one that aids a diagnosis. There is no specific treatment for lumbar radiculopathy but patients seemed to find benefit from regular painkillers. Some patients may undergo physical therapy and chiropractic treatments to allow better conduction of nerve impulses through the affected nerves. Very often, these treatments can help resolve the symptoms in a few months time. However, if the conservative treatment options fail, then surgery may need to be performed to relieve any pressure that is being placed on the nerve fibers. These can include a laminectomy, discectomy and disc placement. Epidural steroid injections are another option and can help reduce the pain due to their anti-inflammatory effect.